While interviewing for another unrelated story for one of my jobs, I had the pleasure of meeting Arun Srivastava, Ph.D., and chair of the division of cellular and molecular therapy at the University of Florida. What I thought was going to be a brief interview to get one or two quotes for another story, actually turned out to be a history lesson about a virus that was ignored for a long time, but has now proved to have life-saving capabilities. To clear things up, Srivastava explained to me that AAV is sort of a misnomer, because it is not related to adenovirus at all. The reason the virus was named adeno-associated is because it was discovered in 1965 as a contaminant of adenovirus. 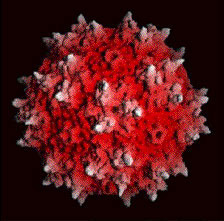 But, AAV, unlike adenovirus is not known to cause any symptoms or diseases, and it is about five times smaller than adeno—around 25 nanometers in diameter. About 90 percent of the human population is infected with this asymptomatic virus. “If you get infected with adenovirus, chances are AAV is piggybacking on it,” Srivastava said. AAV is also classified as a DNA virus, which means it inserts its DNA into the human chromosome. Ok, so there is this virus that we’re all infected with but we wouldn’t even know it since it doesn’t do any harm. Who cares, right? “The million dollar question is why does this virus even exist, ” Srivastava said. Again, AAV was like the quiet child who was simply misunderstood. At that time, Srivastava said only about three labs in the country were studying AAV, but he said Berns clearly saw the bigger picture. He knew that the seemingly useless virus had a novel cause and that basic science was going to solve the mystery. If you’ve seen videos floating around the Internet of an 8-year-old boy being cured of blindness, chances are the savior that delivered the missing gene to the blind person was AAV, which is now gaining popularity as a vector for gene therapy of multiple diseases. Of course, why not use a virus that isn’t toxic right? But, there were still too many unknowns at the time. Many mechanisms of how this virus interacted with the human cell needed to be uncovered before this idea could be transferred clinically. Srivastava said the first major puzzle piece was discovered in 1990, when Berns showed that AAV was actually site-specific, meaning it integrates at a precise site on chromosome 19. AAV, the quiet kid, actually had a mission. He could be used as a vector, a taxicab delivering missing genes to patients with genetic disorders. “You know the total population of India and China is about 3 billion, right? So if I ask you to go find Mr. Wong in a small town in China, would you be able to do that? You can’t right?,” Srivastava said. “But that’s exactly what AAV does, it goes in and finds a precise site at chromosome 19 and integrates there and will just sit there until the cell is in some sort of trouble and come right back out and start to replicate. Terence Flotte, MD, was the first person to successfully inject the AAV vector into humans in 1996. His goal was to treat cystic fibrosis, which is a disease caused by a mutated protein along the epithelial cells of the lung. This causes mucus build up in the lungs making it hard to breathe. Conventional thinking was that AAV could be injected into any cell type in any species and it would infect. Flotte thought that simply putting the virus carrying the new protein into the epithelial cells of lung would solve the problem. But, this feat did not come without error. The quiet kid was still misunderstood. Flotte successfully cured the disease in mice, rabbits and monkeys. But, when the first human was injected, there was no gene expression and therefore, no result. “He had no idea, he thought every cell should get infected,” Srivastava said. While Srivastava was in Indiana after his post doc, Flotte, who was at UF at the time asked him if he would like to come back and work. He told him he would have his own lab and could hire five people, on one condition, no medical doctors, only Ph.D.s. He wanted to focus on basic science to see why his clinical trial didn’t work. The answer came from one of Srivastava’s post docs at the time, Selvarangan Ponnazhagan, Ph.D, who was working on injecting AAV into a line of leukemia cells. But, he wasn’t able to infect those cells either. He said when Flotte saw this, and found out that AAV had a receptor, he now had the answer to why his human clinical trial wouldn’t work. Epithelial cells, which are the cells he was trying to transport the gene to, have two sides. In the lung, one side of the cell is exposed to the airway and the other to the lung matrix. What they figured out was that the receptor for AAV was only on the side that was not exposed to the airway. “So you can put in a truckload of virus but it will never get in there because there are no receptors on the outside that is exposed to the airway,” Srivastava said. Flotte was right and basic science revealed why his trial didn’t work in humans. AAV was more complicated then what was once thought, but it had gained popularity in the universal classroom of biologists, who started to study it more closely. In 2006, another clinical trial using AAV as a vector gave more insight into how this virus operates in the cell. Katherine High, M.D. and Mark Kay, MD wanted to inject the clotting factor into humans with hemophilia to essentially cure the disease. Once again, it worked in mice, it worked in a dog, but the first try in humans was again unsuccessful. There was no gene expression, even after injecting 10 trillion particles of the virus into the body. Thinking there was not enough, they upped the dose to 100 trillion particles. It worked, but the scientists were still stumped because the extremely high dose yielded in expression of 11 percent of a normal person’s clotting factor and in reality a patient only needs about 1 percent of the normal clotting factor to survive. Why was such a high dose needed? The scientists were excited, but their euphoria was halted when the patients t-cells began to attack the liver, leaving it severely damaged. Srivastava said they knew the answer already, and it once again came from basic science, and from the thesis of one of his graduate students who was looking at how much of AAV actually makes it all the way into the nucleus of the cell. Jonathan Hansen, MD, showed that only about 20 percent of the virus makes it to the nucleus, which is why such a high amount was needed in the clinical trial. This is because the cell sees the virus particle as a misfolded protein and the proteasome degrades it. That’s why 80 percent of the virus stayed in the cytoplasm, and every little bit that could escape got into the nucleus. They decided that if they could figure out the signal that was causing the protein to get degraded, then they could bypass it and then the every virus particle would survive, and therefore transport more genes with the clotting factor. They figured this out, and after replacing some of the amino acids that gave the signal to the proteasome to degrade the virus, the new and improved AAV vector was born. Now, when injected into the body, every particle was able to make its way through the cytoplasm and into the nucleus, making it an efficient vector for gene therapy. AAV could be described as an old car that had bad gas mileage being upgraded to a more efficient hybrid car. This modified version of AAV has now been used to cure hemophilia in dogs, and Srivastava is almost positive it will work in humans with no adverse side effects. Twelve years ago Berns premonition came true, and AAV was used to cure a form of blindness called Leber’s congenital amaurosis, which is caused when the protein that carries the light signal to the back of the brain, is missing. William W. Hauswirth, Ph.D. first cured the disease in a dog, and in 2009 an 9-year-old boy from Philadelphia was able to see again. “So things were not all hunky dory in the beginning, you know it went through, its been a very slow process,” Srivastava said. “But, the next five years you will hear a lot about this. And that was my (sorry very long) introduction of a quiet virus, who probably hates public speaking so I decided to speak up for him. AAV—an awesome virus—coming to a clinical trial near you. Keep in mind, this was the perspective of one lab in the country and that many others have contributed knowledge to discovering how AAV works. Herpes Simplex 1 is one of the most common viruses in the world, with an estimated 90% of adults being exposed during their lifetime. It is associated with cold sores or blisters developing on the mouth, nose and lips.